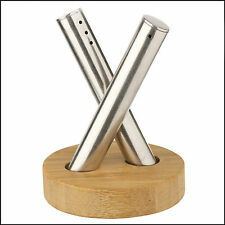 Bamboo & Stainless Steel Salt & Pepper Set . 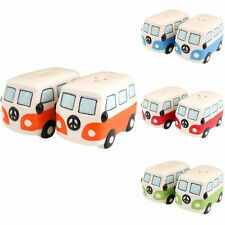 This novel Salt and Pepper Shaker Set is a delightful addition to any kitchen or table. Bamboo Base. 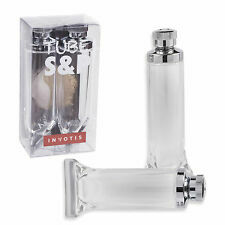 See our range of Salt & Pepper Cellars! Stainless Steel Shakers. These quirky tropical flamingo salt & pepper shakers will make any table look cool! Perfectly kitsch these will make the perfect addition to your dinner table. Material - stoneware. Novelty Russian Doll Design Salt Stacks On Pepper For Authentic Russian Doll Effect! Salt Stacks On Pepper For Authentic Russian Doll Effect! Russian Doll Salt & Pepper. 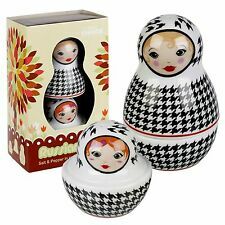 These novelty Russian doll design Salt and Pepper Shaker Sets can be placed on the table as a set or stacked like real Russian dolls. 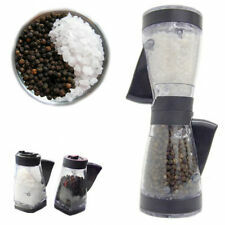 SALT & PEPPER POT SET. (No makers marks). Appear unused. WAITER SHAPED. SALT PEPPER HOLDER. Here you?ll find the latest and greatest products. In other words ?. When you order from us, you?ll always get a great product at a great price. GREAT FOR TABLE DECORATION. EPNS vintage cruet set. In good condition. Nice decorative piece. Allessi Salt And Pepper Set Yellow In Box. This has been used on display only. Caravan And Camping Salt And Pepper. Condition is Used. Dispatched with Royal Mail 2nd Class. A di Alessi OrienTales Banana Bros Salt & Pepper Set. This is a beautiful little hand decorated set, designed in collaboration with the National Palace Museum Taiwan. This is brand new and comes in original packaging. Dispatched with Royal Mail 2nd Class. 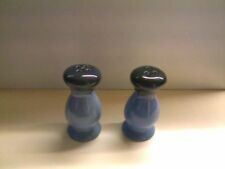 7 Disney salt and pepper shakers New without boxes. Condition is New. Dispatched with Royal Mail 2nd Class. 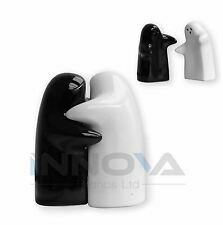 Novelty salt and pepper pots. Condition is New. Dispatched with Royal Mail 2nd Class. Looney Tunes Burbank CA Salt & Pepper Shakers Pots. Only been displayed, never been used. Excellent condition - no damage. Unboxed. Height approx. 5" Items will be dispatched within 2 working days via Hermes which is fully tracked. Any questions, please feel free to message me. They are in excellent condition and will bring a smile to your face whenever. This item can be collected. 100% of the money raised from the sale of this item will fund our animal welfare work in the community. General Information. Quaint little cruet set. Mark on base seems to say ‘Reg Bending’. I have searched but not found who he is! NOVELTY UNICORN RAINBOW WHITE CERAMIC SALT & PEPPER CRUET CONDIMENT SET. Orla Kiely Owl Salt And Pepper Shakers. Condition is New. Dispatched with Royal Mail 1st Class. Wade Tetley Tea Gaffer And Stanley Salt Pepper Cruet Shakers. Condition is Perfect, only ever been on display.. Dispatched with Royal Mail 2nd Class. Flying Pigs Salt And Pepper Shaker. Condition is used but in great condition. No damage. Dispatched with Royal Mail 2nd Class. GOOD RETRO BLUE AND WHITE DESIGN AND PATTERN. Vintage Crested Llandudno Salt & Pepper Shakers Pots Set. In used but good condition. Unboxed. Height approx. 4 1/4" Items will be dispatched within 2 working days via Hermes which is fully tracked. Any questions, please feel free to message me. Have been unable to identify what the words are on the Toucans to say where they can from. 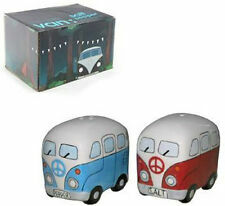 Lovely, fun and colourful salt and pepper pots in great condition with a lustreware style finish. See you Soon. Very cute and unusual. From Japan these little salt and pepper pots are not in perfect condition as the paint is showing signs of wear. See you Soon. Silver salt and pepper pots. Condition is New.and boxed Dispatched with Royal Mail 2nd Class. (Colour: Black/White. :) G reat talking point around the dinner table to P ut a smile on peoples faces :). Including Various Colours, Styles And Designs. 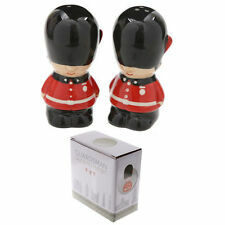 These very unusual salt and pepper pots. A great addition for the caravan enthusiast. Hand painted and with original stoppers. Ceramic Cat Salt and Pepper boxed set. Condition is New. Dispatched with Royal Mail 2nd Class. salt and pepper pots novelty. Condition is Used. Dispatched with Royal Mail 2nd Class. 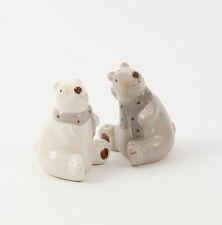 Cats Salt and Pepper Pots Shakers Cruet Set. Condition is New. Dispatched with Royal Mail 2nd Class. Beautiful China Carrot and peapod salt and pepper pots with corked filling holes. Carlton ware? Approx 1960s. (Had these a few years and not sure about the history..but research tells me the above info). The peapod has a slight hairline crack on the leaf section...nothing that would affect its use. (see photo) Very collectable. Vintage novelty salt and pepper pots. Condition is Used. Dispatched with Royal Mail 2nd Class. Vintage Wooden Salt And Pepper . Condition is Used. Dispatched with Royal Mail 2nd Class. antique salt and pepper chickens. stunning. Condition is Used. Dispatched with Royal Mail 2nd Class. Salt and pepper sprinkler. Original Happy Eater plastic container. Supplied in gift box. Finished in high gloss glaze.